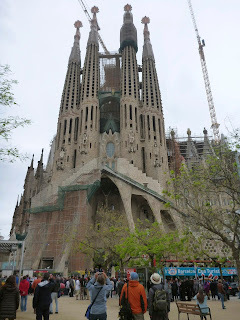 I was anxious to see Barcelona, since my son calls it his favorite city in the world, and friend Karen Curtis says you need at least two weeks to see it properly. I have a week there before getting on a ship to Florida. 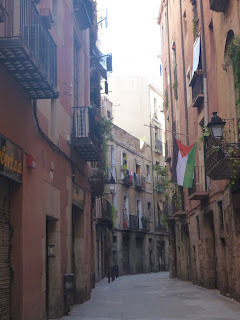 The first four nights, I stayed in an apartment in the Eixample District with five other SAS people. This ended up being very nice and pretty cheap at about $125 for my share. 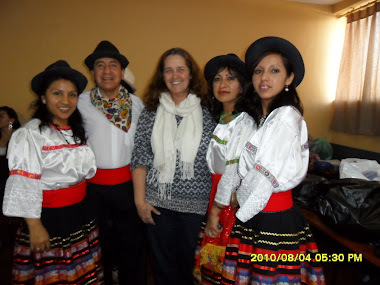 We had three bedrooms, two baths, a kitchen, living room and wifi. It was very comfortable but the design is a little strange. You couldn't swing open or close the shower door without leaving the sliding door to the hall open because of its protruding handle. Also there was a glass block wall between the two toilets, so having two people use the toilets at the same time was a little disconcerting. This is Europe, and I guess they don't have the same privacy concerns we do in the US. Our first day, we all went to a Tapas lunch before visiting the Sagrada Familia, Gaudi's famous church, which has been under construction for over 100 years. It is medieval in feel. They still have many projects left to complete, but it is still awesome. I went on my own to Casa Batllo, another Gaudi masterpiece, the next day. It was built around 1895 as a residence for a Spanish industrialist and his family. It is a contemporary of my old stomping grounds, the Biltmore House, but seems eons advanced in design, though George Vanderbilt thought he was way ahead of his time with his central heating and two elevators. His house still felt very Victorian, while the design elements of Casa Batlio are taken from nature and make it reminiscent of the colors and fluidity of the ocean. I also visited La Pedrera, Gaudi's apartment complex nearby, but did not want to wait an hour in line to get in. Same thing for the line at Palau Guell, off of Las Ramblas. I did go to Park Guell the next day to see his idea of a rural-urban environment. It is up steep streets reminiscent of San Francisco, but they have outdoor escalators to get you up a lot of the steep parts. I went with Susan and Armin, but ended up walking home on my own because I wanted to stay longer. It was all downhill and through some charming neighborhoods. I thought I lucked out when I got to the Picasso Museum and the line was not very long. Then someone came by and said it was closed for the day because it was Labor Day. Sure enough, May 1 is Labor Day in Spain and most of the museums are closed. So after standing in line for awhile for nothing like a stupid tourist sheep, I took a nice walk along cobblestoned Las Ramblas and went to the Central Market. 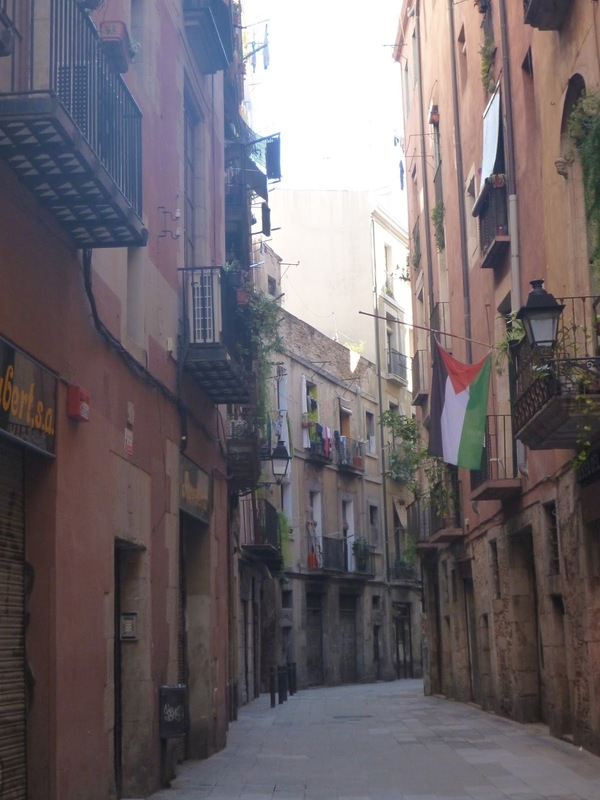 I was intimidated at first by the windy, narrow, car less streets in old town Barcelona, but quickly got used to them. I stayed the last three nights at Hostal Layetana in the Gothic quarter. My room was very basic, with only a sink. I had to walk down the hall for toilet and shower. It did have a great view of the old Roman wall and church tower from my balcony. 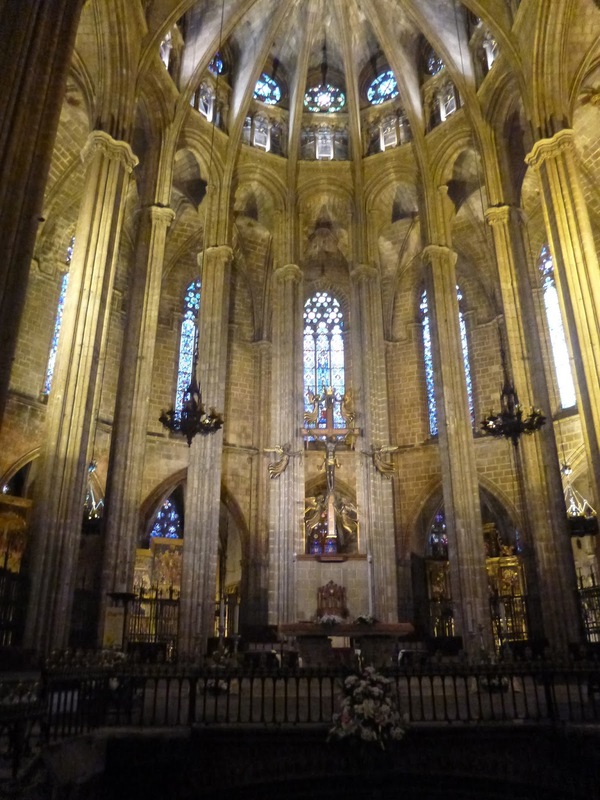 I visited the old Barcelona Cathedral and Barcelona History Museum. The latter has excavations from the Roman era (1st century BC to 7th century AD) underneath its "modern" section, including public baths and a winery. On top at current street level are a royal palace and a chapel from the Middle Ages. 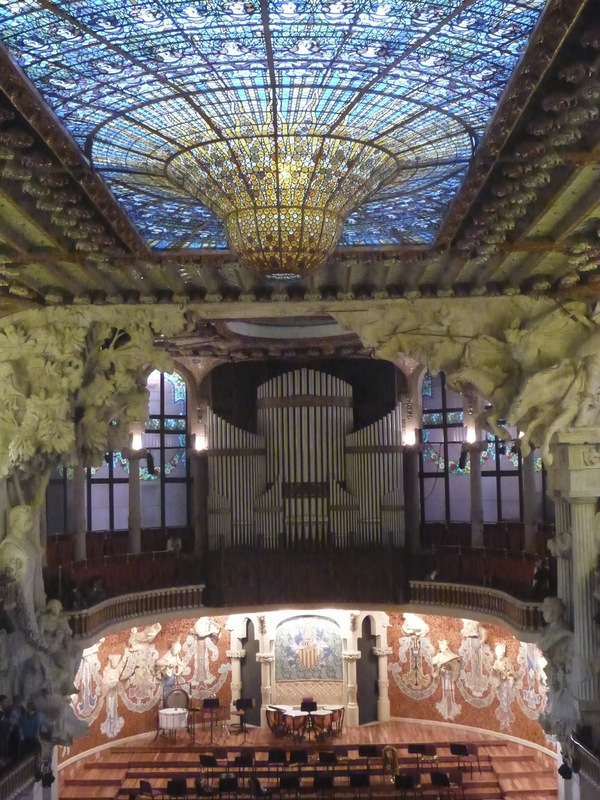 I also went to an orchestral concert of Scheherazade, Romeo and Juliet, and Bolero in the Palau de the Musica Catalana, a stupendous hall that is ornate yet romantic. 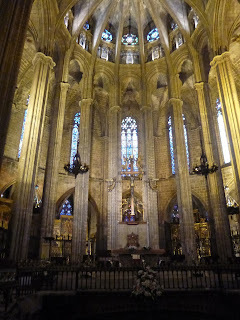 I certainly have a lot more to see in Barcelona. I would love to come back here.